Cherrywood Foot Care utilizes the latest, state-of-the-art podiatric techniques and technologies to treat all of your family’s foot care needs. This includes extracorporeal shock wave therapy, a new, proven way to treat chronic heel pain (such as plantar fasciitis/heel spur syndrome). This unique therapy involves a non-invasive surgical procedure to not only remedy the stinging, painful aches associated with these conditions, but effectively help maintain a comfortable state of foot-and-heel homeostasis. Cherrywood Foot Care‘s team of foot experts will direct sonic waves at the area of pain using a device similar to the machine used in non-surgical treatment of kidney stones. 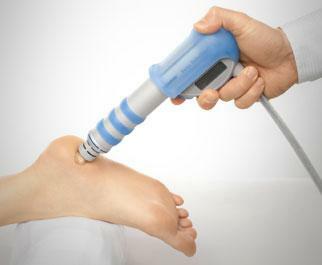 Extracorporeal literally means “outside of the body,” so there’s absolutely no need for surgery to relieve heel pain. Rather, these sound waves penetrate the heel area and stimulate the body’s natural healing response. This procedure typically last about 30 minutes. We also administer local anesthesia and/or “twilight” anesthesia. The process works. Additionally, it’s performed on an outpatient basis, so no overnight stay in a hospital is necessary. Extracorporeal shock wave therapy is a safe and effective alternative treatment for heel pain and only requires a brief recovery time. Yet another benefit is that it costs much less than invasive surgery. It may not be right for every heel pain problem; a consultation with one of the trained professionals at Cherrywood Foot Care will advise accordingly. We’re also happy to provide you with more information about this latest therapy and discuss what treatment options might work best for your condition.